USC Routs Hawaii, but Is There Trouble Ahead? USC is back, for the question could be for how long? 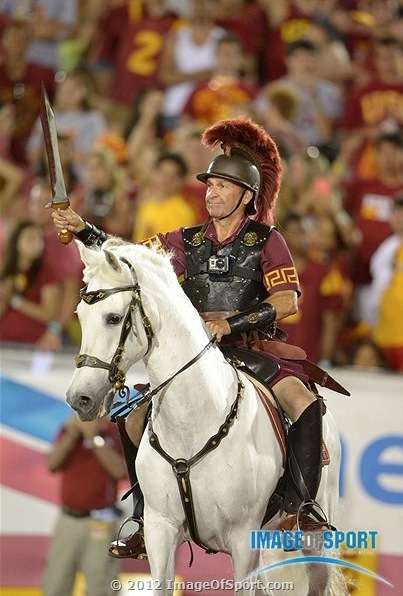 The top-ranked Trojans trotted out Traveler, their mascot, then rolled to an impressive 49-10 victory against Hawaii on Saturday night at the L.A. Coliseum. But the result came after the Los Angeles Times reported that former L.A. County assessor's employee Scott Schenter acknowledged giving a Chevrolet Monte Carlo to former Trojan running back Joe McKnight during the 2009 season. The new allegation could once again get USC, coming off two years of NCAA probation, in trouble again with the governing body. Saturday's game also featured a matchup of former USC assistants. Norm Chow was coaching his first game for Hawaii and Lane Kiffin was starting his third season as Trojan head coach. Image of Sport provided the photos. There are more images after the jump and even more at the Image of Sport page from the game. Any Validity to Allegations of Point-Shaving at Hawaii? The Honolulu Police Department issued a statement Tuesday night saying it did not have enough evidence to open a criminal probe into allegations of a point-shaving scheme involving members of the Hawaii team. The University of Hawaii Admissions Office received an anonymous letter Nov. 3 that accused unnamed players of intentionally playing poorly to impact the final score. University officials then alerted the Honolulu police. Do claims in the letter warrant an investigation? There was that game at Nevada Las Vegas on Sept. 17. Hawaii was favored by 17 and lost by 20. As R.J. Bell of Pregame.com writes, teams favored by 17 or more points this season have won 217 of 226 games. Of the nine who lost, only one — Hawaii — lost by more than seven points. But there's more to the story. Bell takes a closer look the Warriors' record against the spread and you can read what he has to say by clicking here. College football officially has a problem. Instant replay has gotten in the way of the game. Saturday's Hawaii-Louisiana Tech game took 3 hours 56 minutes to play. There were numerous stoppages, including a 22-minute delay in the second quarter while officials tried to figure if Hawaii had been given five downs to secure a first down. "I'm still waiting to find out what happened there," Louisiana Tech coach Sonny Dykes said. It's not uncommon to see 7-10 stoppages per game to review on-field calls, but if replay is being used to keep track of downs, then it's time college football take another look at how the technology is being used. Are Stoppages to Review On-Field Calls Hurting the Game? Update: The Western Athletic Conference has issued an apology for the 22-minute delay in the game. The Hawaii Bowl is one of seven postseason games owned and operated by ESPN. The game has been played annually at Aloha Stadium in Honolulu since 2002. 2010 participants: Hawaii and Tulsa. Survey: Hawaii did not complete a survey. Tulsa: The private school declined to offer its expense report or bowl survey to The Wiz of Odds. Hawaii's marching band forms a stick figure of a football player who marches down the field and kicks a football. Not sure what game this is from but it's very cool.